Ishwari Majhi, 42 years old, lives in Eklephant village of Sindhupalchowk district. She lives with her husband, two children and father-in-law. The family’s main source of income is sand mining in the Indrawati river. Their income is just enough to meet their expenses, with no ability to save at all. When the disastrous earthquake struck the community on April 25, 2015, Ishwari’s village was damaged. 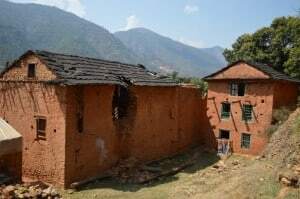 Around 10 houses were destroyed and 22 were damaged or severely cracked, but still standing. After the damage, the villagers including Ishwari shifted to temporary shelters (made from metal sheets) next to their existing settlements. Their living conditions were tough with no protection from cold and wild animals. 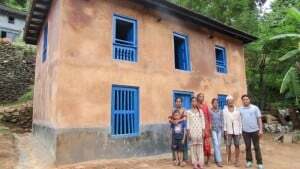 Since her house was still standing, Build Change approached Ishwari Majhi to seismically retrofit her house. The building was shored prior to starting the retrofit work. 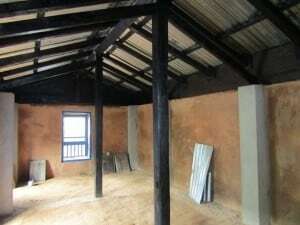 Then, engineers applied a retrofit procedure designed by Build Change to strengthen the low-strength masonry buildings of rural Nepal. 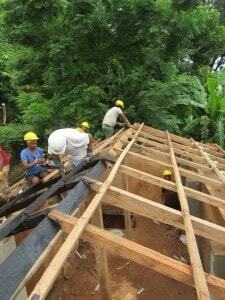 The retrofitting was completed in two and half months, while providing on-the-job training to nine local builders. Moreover, after seeing the newly retrofitted house, Ishwari’s neighbors and members of her local community realized that retrofitting is a good option for those homeowners whose houses are damaged but not totally demolished. 18 households in Eklephant have decided to retrofit their houses.